Justin Taylor, a three-time convicted felon who’s been homeless in Palm Coast for several years, was arrested Sunday morning after an altercation with a store clerk at a convenience store on Palm Coast Parkway, where he stole one pack of cigarettes and a can of tobacco. Bunnell’s new ordinance prohibits panhandling within 20 feet of any business or commercial property, alongside drivers or diners, but limits penalties to fines. Matthew Edward Marro, A 22-year-old homeless man, faces 10 felony counts following a confrontation with children at a Bunnell park Sunday. The Sheltering Tree, which depends entirely on donations, has provided the homeless with food and extreme weather shelter since 2008: the shelter opens whenever the temperature falls to 40 degrees or below. The number of homeless fell to 104 people in January, compared to 104 the previous year, as the economy has improved. But the lack of affordable rents remain a challenge. A over-capacity crowd jammed the Santa Maria Del Mar Catholic Church in Flagler Beach Sunday evening to raise money for The Sheltering Tree, Flagler’s only cold-weather homeless shelter, in Bunnell. The fundraiser for Bunnell’s Sheltering Tree, in operating through volunteers since 2008, will be held from 5 to 8 p.m., Sunday at the Santa Maria Del Mar Catholic Church with the participation of numerous local restaurants. The 2016 Northeast Florida Community Action Agency’s award cites Traister’s work at the Sheltering Tree, Flagler County’s only homeless shelter on cold nights, which Traister co-founded in 2009. The 2016 census of the homeless population in Flagler-Palm Coast was a dramatic decline from 2015, but also very likely an under-count. The majority of homeless people who have no shelter at all are in Palm Coast. For eight years First United Methodist Church in Bunnell had been an unofficial day shelter for the homeless. The church’s new leadership is changing that as finances and a different philosophy is compelling a more restrictive approach. Rev. Gardner, who will lead a parish in Lakeland starting in July, transformed the church into the county’s most progressive advocate for the homeless, housing a cold-weather shelter and keeping awareness about homelessness on the forefront of county and city agendas. Feed Flagler’s 364-Day Blinders: Why Isn’t a Portion of Old Courthouse Considered as Homeless Shelter? It must be Thanksgiving because as with the first Thanksgiving, the pilgrims seem more interested in clobbering the poor than feeding them. It’s not that there isn’t a homelessness problem in Flagler and Bunnell, but while numerous and at times generous services are being provided, minor conflicts targeting some homeless people in Bunnell are disproportionately affecting the debate, and draining attention from what’s being done to help. A week after being “called on the carpet” before the Bunnell City Commission for providing an occasional shelter for the homeless at Bunnell’s First United Methodist Church, Rev. Beth Gardner this evening was honored by the Flagler County Commission for that same mission. Bunnell’s First United Methodist Church is the closest thing Flagler County has to a homeless shelter, but a few residents are critical even of that limited help, claiming it’s blighting the city, while the City Commission wants county government, Palm Coast and Flagler Beach to pitch in for a solution. Unseen and unheard opponents of the cold-weather shelter in Bunnell have complained to that city’s mayor. 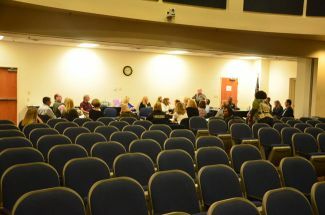 Shelter advocates made their case at a city commission meeting this week.